There are no comments for Viking Vegvisir Rune Calendar Sterling Silver Pendant. Click here to post the first comment. 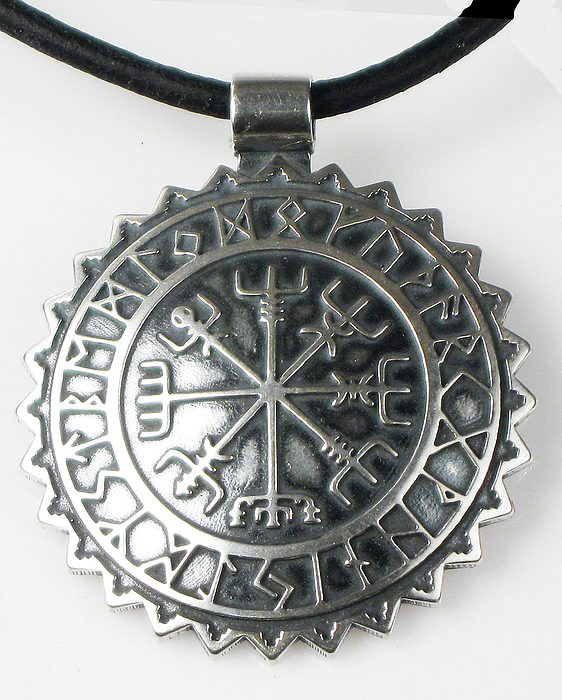 A large, chunky, Sterling Silver Vegvisir key ring or pendant, thick as a coin. This nautical key ring represents "Vegvisir," which is an ancient Viking term for "direction sign" or "see the way." This compass key ring prevents you from getting lost. 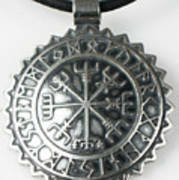 It is a "brun rune" or sea charm. It is surrounded by a border of Rune calendar month characters. It would make a lovely gift for a Mariner, sailor, nautical person or world traveler. This lovely quote defines the way I feel about this design: "Brave we were to anchor together under the moonless sky, but we shared this compass and followed those stars and here we found our harbor." 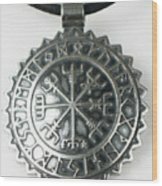 It measures a little larger than 1.75 inches (45 mm) in diameter. It is quite substantial in size. It has a large Sterling Silver tube bail that fits most chains.